Lyconic is releasing a new version of Inteliguide & Patrolguide! This brief intro intends to familiarize you with the look and feel of the new version while providing a quick overview. Note: This introduction is for Clients of security companies using Inteliguide & Patrolguide. If you're a security owner or manager, please click here. If you're an employee of a security company accessing Inteliguide for the first time, please click here for your officer manual. Your Profile - Featuring Report Delivery Automation! You may have already clicked to this article from the new Login page, perhaps after having been redirected there unexpectedly. Don't worry. All your information has been preserved and migrated to the new version of Inteliguide. We've made some changes to Inteliguide & Patrolguide V2 that take advantage of more modern browser technologies. We're now able to bring all our varied Users - from Administrators, to Officers, to you as Clients - a more advanced and responsive user experience. As such, we don't support all the browsers that were supported in past versions of our software. This may require some adjustment for some folks still using older computers with older operating systems and browsers. Many of those older systems are able to accommodate more modern alternatives to Internet Explorer (IE), but due to how Microsoft structures their Operating System (OS) and browser versions, newer versions of IE are not available on older versions of Windows. IE 9 is the oldest version of IE that we support. We highly recommend either upgrading to the newest version of IE (again, Internet Explorer), currently IE 10, or installing Google Chrome as an alternative. Thanks for your understanding as we continue to push the capabilities of our software. Enter your email and password, they should not have changed during the migration to the new system. If you should need, click on the RESET PASSWORD link and enter your email address. Click SEND and check your inbox for further instructions. Below the orange line is the Main Navigation. Any new system notifications, generated files, or internal messages will first appear here. 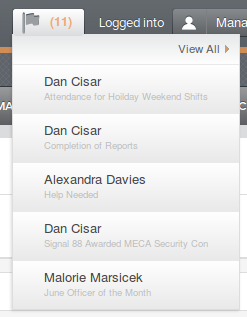 Clicking "View All" leads to your Inbox. This is where you will find basic profile info and can choose which Franchise Context (Market) to work in depending on if you are Authorized for more than one Franchise. 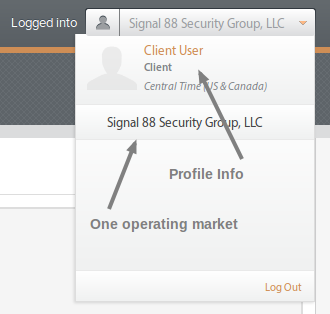 A fair amount of Signal 88 Security Clients will not have to worry about operating in more than one Market Context, but there are some Clients whose Businesses span more than one Signal 88 Operating Market. The area below the orange horizontal line and the gray horizontal line contains the main navigation for Inteliguide. 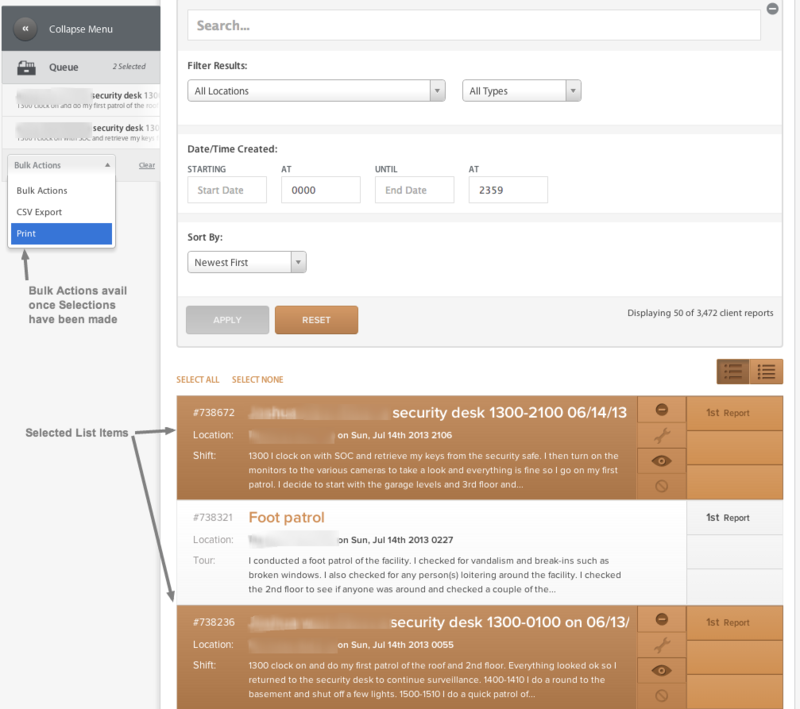 Little has changed from the old version to the new in the V2 Dashboard, also called Home, besides the look and layout. 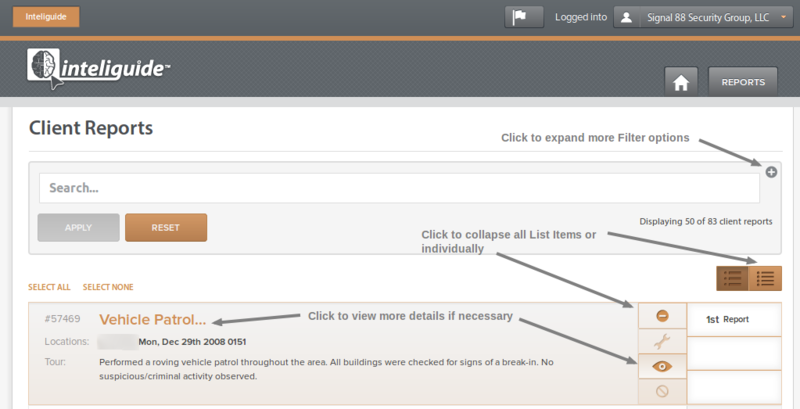 Click on the REPORTS tab in the Main Navigation to navigate to your Reports List. To do anything beyond Searching, simply click the '+' icon to expand more panel options. Categories can be used to separate the signal from the noise, so-to-speak. Look for the most important detail and drill down to other detail as necessary using the Categories Filter. Activities are your most common type of report. These catalog everyday officer activities as they observe and report at your locations. 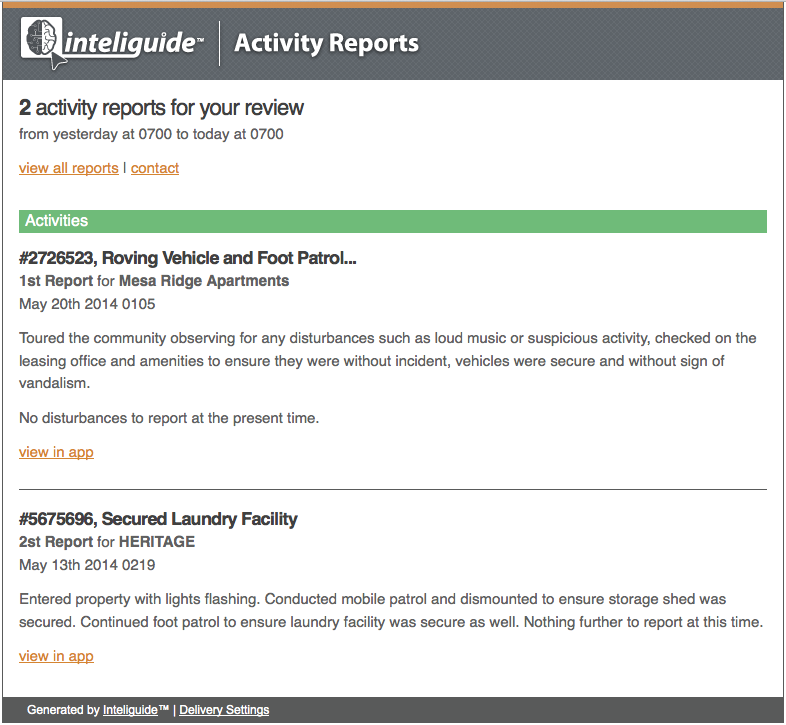 Flagged Activities are common reports of elevated importance. They're not emphasizing maintenance concerns or security breaches and crime. Think an uncommon vehicle in a parking lot, a note about something that may need your attention, or movers temporarily propping open a secured access. Flagged reports are given additional explanation by the officer. Maintenance issues involve anything from lighting assessments, overflowing trash bins, drives and walks obscured by weeds, graffiti, storm damage, etc. Incidents involve security breeches, crimes, ban & bar, noise complaints, parking violations, etc. Note: Name A..Z & Z..A only apply to Managers who are able to Filter results by User Name. We'll be modifying this in the near future. While the List loads with the most recent Report written appearing on top of the list (Newest First), you can restrict the time range to narrow down on specific day and time windows. This section also displays the number of tours and the total tours available as dictated by your filter settings. After setting your search and filter settings, scroll down the page to load more reports, the panel will scroll with you so you can keep informed as to your settings. The List loads 50 at a time, with the first 50 reports loaded by default. Note: As pointed out in the Quick List Snapshot image (above), you can click on the individual '-' icon of any of the list items to collapse them. That icon turns to a plus if collapsed (see below), so clicking on it will in turn expand that given List Item. Click on List Items to Select Reports. 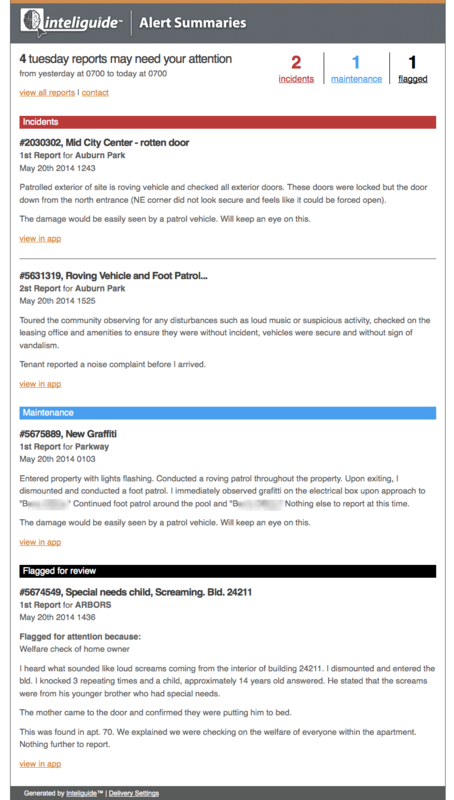 Click on the Header Links of the List Items to view the Detail View of any given Report. Alternatively, clicking on the 'eye' icon will bring you to the same Detail View. Once a Selection has been made, a left-hand sidebar view appears which allows you to see the first several items in your Selection Queue along with a total count of all the selected items. The Queue will stay with you as you scroll down the List of Reports. 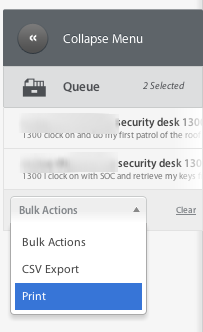 Clicking on CSV Export in the Bulk Actions drop down will generate the CSV file and clear your Selections. Here you can see the Report Number, Summary (Title), Location - Date - Time Reported at, and Detailed Note. This contains cursory info about the Type of Report (Shift/Tour) and its Start Date/Time, along with the number of Reports written. This will list the one or more Locations that the Report was written for. If more than one Report has been written for a given Shift/Tour, this will help you keep track of and read through each one in sequence. These headers will appear over each Report of their kind to indicate the Report Category. Normal Activity Reports do not receive a special header. The Flagged for Attention Reports will have additional information explaining why they were called to your attention. Click on your User name as seen in the Profile section of the Context drop down in the Context Menu, or on the Profile Widget on the Dashboard. Here you can see the some of the same info you can find on both the Context drop down on the Context Menu and on the Profile Widget on the Dashboard. Your User Name, login email, and Member Since Info. Click VIEW REPORTS to access your Reports list. Here you can view your one or many Contact Phones that were either entered when your Account was created, or that were added by you at a later time. These are links to external resources that Signal 88 staff can manage internally. Only those links meant for Clients will show up here. Personal Settings - Report Automation: Category Alerts & Summaries NEW! Would you like summaries of your alerts? Click PHONE + to add additional Phone Numbers to your Account. Click the 'X' to remove existing Phone numbers. Then simply hit SAVE to record all your changes. For security reasons, you must enter your password and confirmation in order to save your settings on this form. My officers are loving it. It is SMOKING FAST with Verizon 4G! They don't like the clocking in and out feature, but I sure as hell love it! This new version is more streamlined and faster than before. Keep up the good work guys!! !